Alias: Dysta -- she wasn't that creative. Secret ID: Dysta -- no secret! Current Residence: Currently "lives" in SGPA headquarters or hangs around Solar Cat. Hair Color: Black with bright blue bangs on the right side. Hair Type: straight and long down to the starts of her thighs. Dysta's on the small and lean side, and looks Asian in descent. She is always seen wearing her crystal flower half circlet (they used to be a set of 4 crystal flower clips). Over the past 5 years, it doesn't seem like she has aged a bit, although her uniform as received a bit of a cosmetic upgrade. Dysta loves dressing in all kinds of bright colours, and never wears just one or two colours. Dysta tends to dress on the stylish side, though always comfortably. Solar Cat fondly calls her a hipster due to her sense of fashion and mix of different clothing styles. She likes scarves and arm and leg warmers and fun nick-knacks. She enjoys the whirl of dresses and skirts. General Personality: Comes off as spacey or detached from worldly concerns (because she is!). Easily bored (might look like ADHD to some). Cheery, bubbly, and willing to give advice (although it is often bad or uninformed). Mischievous, likes harmless pranks (really likes April Fool's), and loves doing silly things. Dislikes adhering to rules or submitting to authority figures, but she likes doing favours for people, especially if she will get something she thinks is worthwhile in return. Bad Traits: oblivious to social etiquette (earthling etiquette anyway), often makes rude remarks or makes bad nicknames, doesn't compromise, immature-seeming, prone to lying (for the fun of it--usually harmless, but annoying! ), poor "common sense", is a cheating cheater that cheats whether she can or can't get away with it! AND she fails to understand people's anger/irritation when she does get caught! Hopes: Going back home. Making lots of friends. - Haha, you think with your evil powers you can destroy this world that's full of my new friends?! Well, think again! I am Dysta, defender of hope, justice, and friendship! In the name of myself, I'll .. BEAT YOU UP! - Free will is wasted on you cretins! Closest Friends: Solar Cat, Sugar Space Bunny, Black Seiren, Zenith, Mint, Sage, Star Girl. Enemies: Johnny Keith, anyone who gets in her way. "Badguys" in general. Power(s): Her abilities are actually metaphysical/magic-based. Solar Cat is the one who categorized and named her abilities for her. SYNCHRONIZATION: This is divided into two sub categories, but it's based on her ability to synchronize her abilities with her allies. Demi-Sync: With their agreement, Dysta can copy/mimic the skills and abilities of any of her allies for a short period of time (usually 10 minutes or less). CONS: gains the weaknesses of ally. If the ally gets hurt, so will she, and vice-versa (they feel each other's wounds and if one is knocked out, the other will be too). She can only Demi-Sync with one ally at a time. True Sync: This is a passive ability. As Dysta gains the approval and friendship of more allies, her skill level and strength increases. In battle, she chooses 3 nearby team mates so her strength is the average between them (team mates should stay within 20 meter radius for her to maintain her average). Outside of battle, it's a cumulative small percentage of each ally she gained no matter the distance. PROS: increases her base strength and skill level as she gains more allies/friends. Very advantageous if she has 3 very powerful team mates with her in battle. CONS: must make a pact with the ally/friend (does not require a Spirit Pact, but that usually means tricking a person into a pact). Pact-making is invasive and means Dysta can read the ally's thoughts and gain access to their soul and spiritual links (most people will not want to do this--it looks similar to making a contract with the Devil). If friends are wounded/killed, her stats can decrease. If allies move out of her range, her average also drops. She is weak if no allies are in a pact with her. Spirit Pact: Dysta can make a Spirit Pact with a friend or ally as an incentive to allow her to True Sync with them. This lets her imbue the ally with some magic powers or abilities by opening access for them through the spiritual realm. Once this link is made, Dysta can be summoned to the ally's side almost instantaneously (she travels through their spiritual link, kind of like travelling through their soul). PROS: Gives ally access to superhuman or magical powers. Can instantly teleport to ally's side to provide assistance. CONS: Powers granted can be random or hard to control (although usually based on ally's elemental affinities). Ally may summon Dysta needlessly, and summoning Dysta tires her very quickly--plus, it's annoying. This is why she doesn't like making Spirit Pacts and tends to be choosy. Spectre Flight (upgrade of Ghost Flight): Flies very fast in an almost effortless manner. She can converting her body into a ball of light that's roughly the size of a large grapefruit (15 cm diameter). Subtle Extraction (upgrade of Spirit Mining): By accessing local spiritual pockets in the subtle planes, Dysta can mind-read and gain personal information quickly from people who are spiritually "open" (usually in a compassionate mode or very emotionally distressed people). It usually won't work if the target is aware that Dysta can do this. Another result of this skill is that she is able to store and access her spirit-based spear on command. She has also learned to harness the energy form the subtle planes when she accesses them in order to pull out sparkling energy orbs that can be flung or shot through her spear at the enemy. CONS: information mining can't be used if person is aware of her ability, so it's usually one-time use. Can't be used if a person is naturally mentally guarded. Sparkling energy orbs are fairly weak. OTHER POWERS: There is an assumption that she has all sorts of other powers and abilities, since she's a tricky spirit, but she doesn't reveal them, so it's pointless to list. The only other significant thing is that she is able to insert herself into whatever school she wishes (perhaps using her allies' links to the place so it seems like she "fits in"). No one knows how she does it. No, not even me. Its a magic thing. Weapon(s): Wields a spear made of her spiritual energy, thus it is weightless to her. The spear can be reabsorbed into her at will. Style: can vary depending on allies. Usually very light and quick in the air, so she likes aerial battles and throwing sparkling energy orbs from a distance. She whirls around with her spear a lot, which is like an angry swarm. Strengths: relies on strengths of allies so is a team player. Weaknesses: weak and ineffective without allies (e.g. her spear attacks will hardly sting without backing allies). Pretty slow and ineffective while on the ground unless she has ally skills to counter that. Dysta is a spirit being that fell from her abode (wherever that is. We assume "Heaven" or some fancy spiritual realm), and can't get back there on her own. 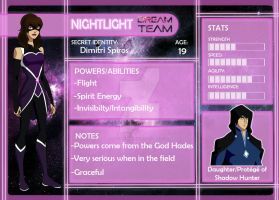 She is a special spirit that is able to mimic the abilities and strengths of allies through "syncing". When Dysta fell from her abode in 2007 (SGPA Year 00), the first people she met were Solar Cat and Sugar Space Bunny. She looks Asian because she mimicked them in heritage. Dysta used what powers she had to info-mine them and figure out what they were up to, where they lived, and where they usually went. She used this information to lie and say that she was doing what they were doing and was going to the school they were going to, and then was able to fit into the school as a way of "piggy-backing" off of their presence. Soon after, Dysta made spirit pacts with Solar Cat and Sugar Space Bunny when they let her join their Super Galaxy Princess Alliance. This granted her friends powers and they went onto expanding the SGPA and helping Dysta gain allies in order to help her return home. This led them to being in Gotham from 2010 (SGPA Year 03) onward, and they became affiliated with the Justice League's younger espionage and covert team. However, after a falling out with the Justice League, the SGPA set up their own headquarters and Dysta used it as her new home base. She has since achieved somewhat of a mascot status for the Super Galaxy Princess Alliance, and is their figurehead "leader", even though she usually does not make many of the decisions. Many allies have come and gone since that time, but Dysta had overall been able to gain allies and skills, giving her a significant stat boost by 2016 (SGPA Year 09). She was also able to develop new skills. In general though, she is the same as ever, generally hanging around Solar Cat and causing mischief (especially to villains) with her friends. Oh such sparkly and dazzing power upgrades~!! Hah! if only Na'vi was as annoying to villains! xD AHH, AND SHE'S SQUISHY TOO! OH GOSH, HOW CUTE! You could put her in your pocket!! FIFTEEN MINUTES IS MORE THAN ENOUGH. O_O ENOUGH FOR ALL THE FUN AND CUTENESS. ...true.. xD And I have the file on my usb... PERHAPS THIS WILL HAPPEN. Always nice to fill in profiles after lots of art-ing anyways!